Q. What information do you have on the Henry Ford Trade School? Henry Ford started the Henry Ford Trade School to teach boys industrial arts and give them an opportunity to earn money while they learned. Boys age 12-15 were accepted, with an emphasis on low-income children who were orphans or breadwinners in fatherless families. Students split their time between academic classroom work and on-site shop training. Once graduated from the school at age 18 or 19, the boys were offered jobs at Ford Motor Company, took further training at the Ford Apprentice School, or moved on to other companies, college, and opportunities. The school started in 1916 with six boys and one instructor in the AA building at the Highland Park Plant. 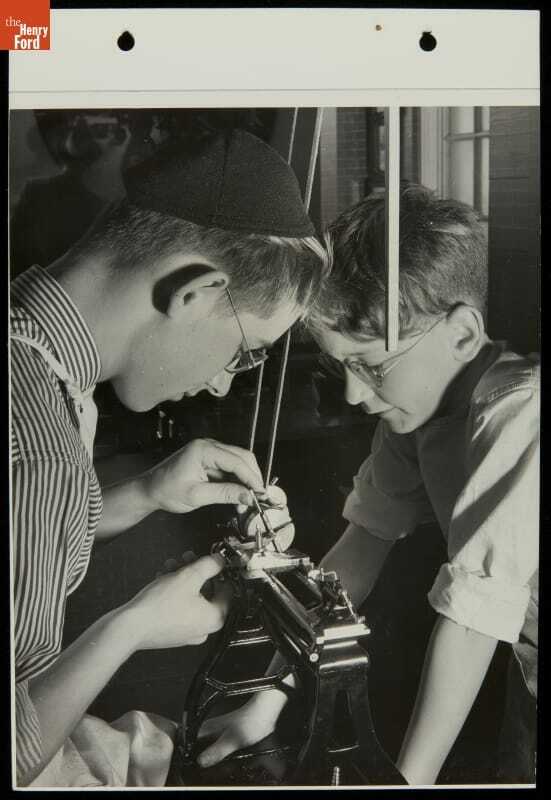 Originally, half a day was spent on classroom work and half a day on shop, as more boys joined, the school switched to a rotating schedule with students divided into three sections M, T, and W with one day in class and the others spent in shop. In 1919, this was changed again with students spending one week in the classroom and two weeks in shop. In 1918, Frederick Searle was appointed superintendent, a position he held until 1946. 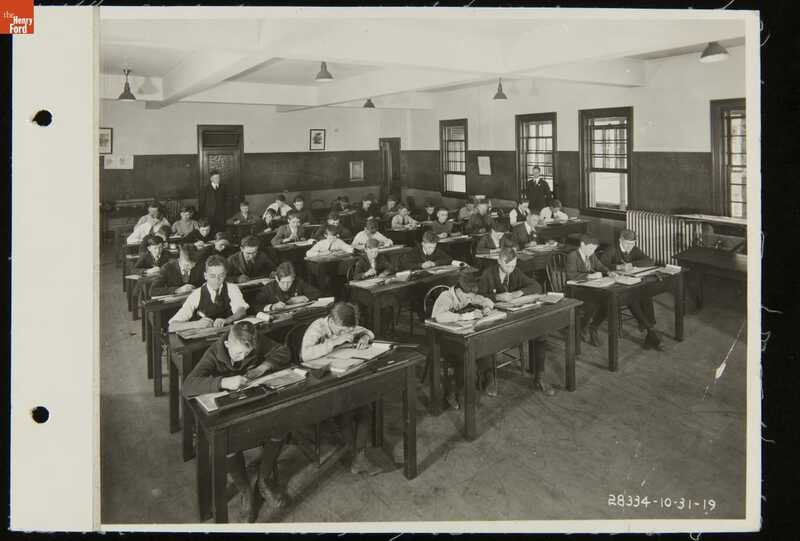 Over the years at Highland Park the school expanded to include a library through the Detroit Public Library and classrooms were established next door at the St. Francis Orphans Home (later Lawrence Institute of Technology). In 1927 a branch of the school was established on the 3rd and 4th floors of the B Building at the Rouge and in 1930 the Highland Park and Rouge Schools were consolidated at the Rouge. By 1935 the Detroit public schools accepted Trade School credits towards a high school diploma, the first Trade School diplomas were awarded in 1937, and the first formal commencement was held in the Rotunda Theater in 1939. 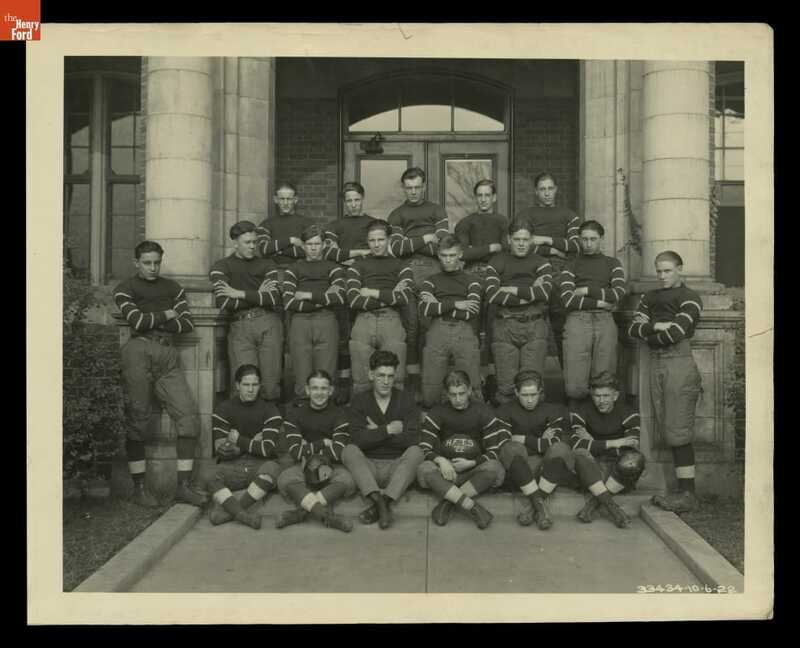 In 1944, the Trade School acquired Camp Legion, the Academic Section of the school moved there and the curriculum was updated to meet requirements of high schools in the state in 1946. In 1948 the Trade School acquired status of an accredited high school and students could pursue higher education without completing their diplomas at other area high schools. 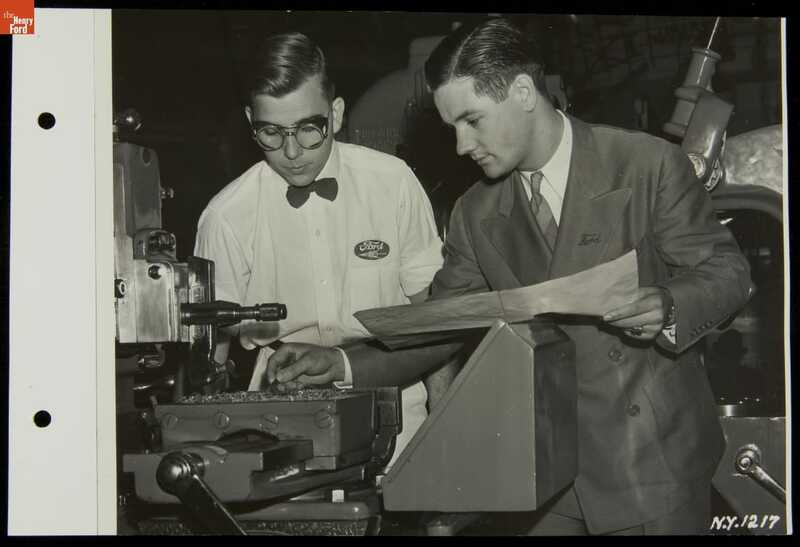 Ford wanted students to benefit from their education and their shop time was used productively; students produced and repaired tools and machinery for Ford Motor Company. From the beginning, students were paid an hourly wage, varying on their experience and time at the school, they were also given $2 per month as a thrift fund which must be placed in a savings account until graduation. Because the students’ work earned money, the school was able to give them 3 weeks vacation in the summer and 1 week at Christmas, as well as supply them with a hot lunch every day. The school also had its own first aid station and dentist. The students were trained in a multitude of courses, both shop and academic. Over the years shop courses included: heat treat, tin shop, woodworking, welding, foundry, electrical, human engineering, pressure and vacuum gage repair, precision tool repair, nickel plating, air tool, and pre-flight aeronautics. Academic classes included: English, public speaking, Foremanship, Human Relations in Business, typing, advanced mathematics, American history, specialized drawing, physics, stresses and strains, strength of materials, electricity, chemistry, metallurgy, metallography, and driver’s training. But it wasn’t all work, students participated in varsity and intermural sports and had an annual picnics at Bob-Lo. They formed the Exploration Club, Dramatic Club, Radio Club, Natural Science Club, Airplane Club, Glee Club, Camera Club, and Safety Club. They started a band, orchestra, German band, and choir. The students also published a newsletter starting with The Artisan in 1926, later the Craftsman in 1935, and lastly Times in 1950. Students had opportunities to share their training and knowledge and traveled throughout the region and the United States at Ford Motor Company exhibits at industrial expositions and fairs, and in 1934 a group of Trade School students participate in the Chicago World’s Fair, demonstrating processes, tools, and materials. During WWII a Civil Air Patrol squadron and pre-flight course work were started at the school. Students also worked alongside Naval Service School cadets, often teaching them how to use machinery at the Rouge. Outside of the school, former students kept in touch and formed the Henry Ford Trade School Alumni Association in 1945. The association had annual meetups, produced its own newsletter, and continued to raise awareness of Henry Ford’s work in education until the members disbanded the group in 2017. The Trade School was closed in July 1952 following Henry Ford II’s decision to reduce Ford Motor Company spending and cut all programs that were not income producing. In the 36 years the school operated it graduated over 8,000 boys from Detroit and surrounding areas. Trade School graduates worked at Ford Motor Company and elsewhere in a myriad of industries and professions. Graduates worked in diverse professions from the automotive industry to art and design, ministry and even medicine and dentistry. Henry Ford Trade School history, purpose, etc. The Craftsman. Henry Ford Trade School. Henry Ford : educator. Searle, Frederick E.
Automotive occupations. Leyson, Burr W.
Ford men and methods. Edwin P. Norwood; illustrated with photographs by Charles Sheeler. For the good of all: a pledge respected. Thomas, Arthur D.